DukeEngage-Durham 2017: Talking with city leadership. 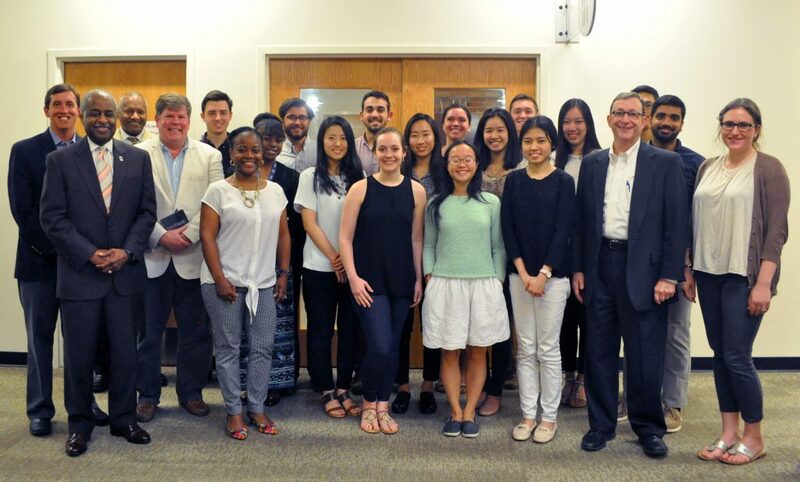 Fifteen DukeEngage students met with various city and university leaders on June 7, 2017, to discuss the history and economic evolution of Durham. The panel consisted of political and university figures including: Dr. Phail Wynn Jr., Duke’s vice president for Durham and Regional Affairs; John Schelp, former president of the Old West Durham Neighborhood Association; Tucker Bartlett, an executive vice president at Self-Help, a nonprofit bank and developer based in Durham; and Durham Mayor Bill Bell. The students were encouraged to use their knowledge and enthusiasm to help find solutions to some of Durham’s more complex problems including: affordable housing and gentrification. Read More.